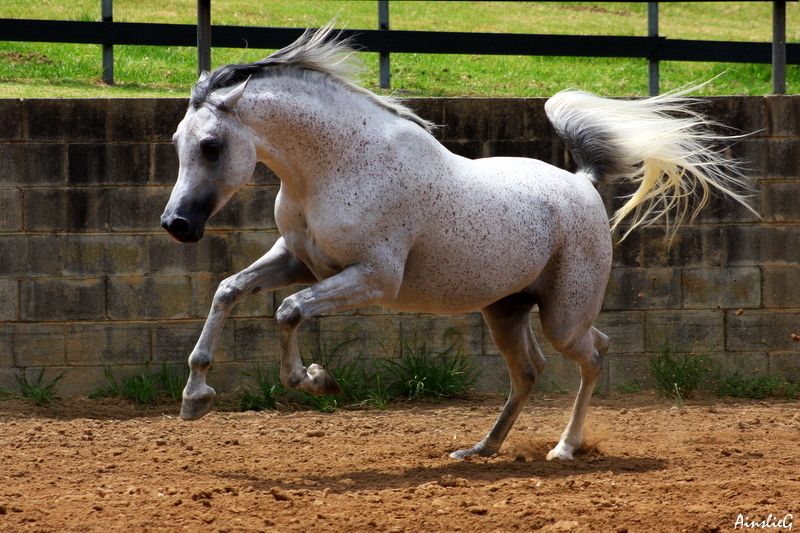 The key, of course, is learning which postures are “normal” for your horse–and which are not…. 1. “Neighs and whinnies,” which a horse uses to announce, “I’m here!” and to acknowledge the presence of another horse. 2. Soft, throaty sounds called “nickers,”which are often used by a mare to encourage her foal–or by any horse anticipating feed time! noses and then the squealing (and possibly the striking out) might start. 4. 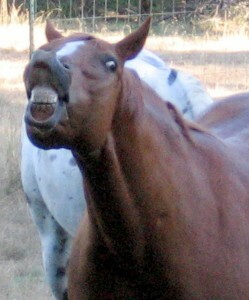 “Snorts,” which horses sometimes use to sound an alarm, such as when a strange animal suddenly comes too close. This is where pheromones–those chemical secretions that influence the physiology or behavior of other animals–come into play. These powerful substances can do everything from calm (as in maternal appeasing pheromones) to excite (as in sexual pheromones). “In terms of smell, horses, like dogs, have incredible smelling power and are sensitive to pheromones conveying information about individuals and their state,” Waran says. McCall agrees that pheromones and even ordinary scents (marking with manure or urine, a mare’s attraction to amniotic fluid, etc.) are probably important in equine communication. “After all, they possess a vomeronasal organ, and both sexes perform flehmen,” she says, referring to the comical curling of the upper lip that facilitates the transfer of pheromones into this olfactory organ. Is equine communication more or less developed than that of other animal species? “That is a hard question to answer,” says Houpt. “Birds, for example, have very complex songs but may not have any more messages than horses. Cats seem to have more vocal communications than horses, and we have influenced cats to vocalize more. “Perception is also important, because horses cannot hear as high frequency sounds as cats,” she continues. “Horses are not used as scent detectors as dogs are, so may not communicate as much with odor, but both species almost always investigate the excrement of another member of their species, so presumably are communicating. To learn more about this fascinating subject, Heleski encourages her students to watch horses as much as they can. “As they develop an intuitive sense of equine body language with horses reacting with one another, students become noticeably better at interpreting body language that will ultimately affect their personal safety around horses,” she notes. “There is still a great deal about [equine] body language that we have not researched,” she adds. “There are probably all sorts of subtle muscle movements in the face, eyes, nostrils, etc., that influence how many of us ‘read’ horses … yet trying to put words to what we’ve seen for the novice horse person can be difficult. Certainly ear position only tells a small portion of the story. “Very often, measures of body language are looked at in various research contexts, but it is still difficult to say with absolute certainty what the horse is feeling,” she concludes.